No opera (with the odd Wagnerian exception) has ever been safe from cuts, little more so today than in composers’ lifetimes. Nowadays edits are on the whole supposed to be unobtrusive: minor tweaks to adjust the dramatic pacing, catering to modern tastes. But Don Giovanni is one of those operas that has long had a big question mark hanging over it, almost since its premiere. The question of how to end Don Giovanni has no conclusive answer, and has profoundly influenced audience reactions down the centuries. Don Giovanni had its premiere in Prague on 29 October 1787. Mozart had been invited to write for the city after the enormous success of his Le nozze di Figaro there the previous year. But despite his popularity in Prague, Mozart’s main base was Vienna and it’s generally assumed that he wrote Don Giovanni with an eye on its future premiere there. This came about on 7 May 1788 – an unusually long delay after Prague, perhaps attributable to the finagling of Mozart’s rival Salieri (or, then again, perhaps not). Mozart conducted both premieres and, as would be expected for the time, was on hand to make various changes to suit the different singers. He took out Don Ottavio’s fiendish coloratura aria ‘Il mio tesoro’ and replaced it with ‘Dalla sua pace’. On the demand of the new Donna Elvira he added in another scena for her, which includes the sensational aria ‘Mi tradì’. He removed Leporello’s aria ‘Ah pietà’ and gave him instead a buffa duet with Zerlina, ‘Per queste tue manine’. There therefore exist two quite different and equally authentic versions of Don Giovanni. It’s long been standard practice to perform a mish-mash of the two. A contradiction between contemporary sources means that it is much less clear what should be done with the ending. In Prague Mozart provided the conventional lieto fine (happy ending): the moment after an unrepentant Don Giovanni has been carried down to hell on the back of some truly terrifying music, the rest of the cast run on and discuss their plans. The opera closes with the summarizing moral ‘Questo è il fin di chi fa mal’ – That’s the sort of end the bad will come to. The libretto for the Vienna premiere excludes this final scene altogether: Don Giovanni goes to hell, and the opera ends. This curtailed ending was popular throughout the 19th century and into the 20th, and allowed the Romantics quite a different reading from that conventional lieto fine. Don Giovanni dies and the opera ends with him; he is not a villain but a hero, a defiant individualist and the prototype of the Nietzschean superman – making the opera Mozart’s most profound and forward-looking statement. Maybe this was the ending Mozart gave the Vienna audience in May 1788. But maybe it wasn’t. Various Vienna scores and others likely derived from Vienna performances offer a host of alternatives: the final scene is included; it’s cut entirely; a half-way cut is made that jumps over the other characters’ chatter and begins with the moralizing (from ‘Resti dunque quell birbon’, a few lines before the famous final chorus). We can’t be sure which ending Mozart conducted, and which, if any, would have been his final choice. This has, to some extent, left the field open. 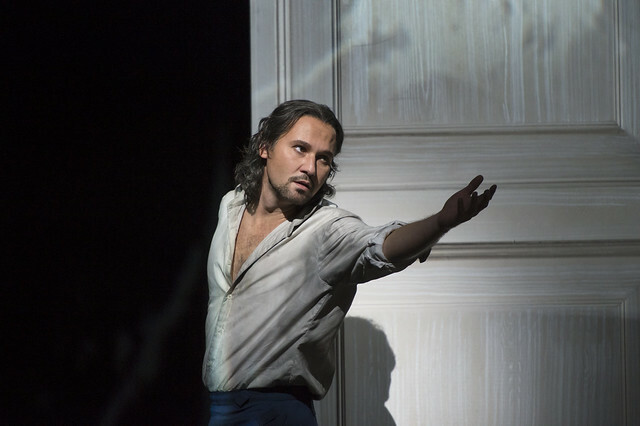 In his 2014 production for The Royal Opera, Kasper Holten cut straight from Don Giovanni’s demise to ‘Questo è il fin’ – though the moralizing characters sang from the pit, leaving the desolate Giovanni alone onstage. In the production’s first revival, onstage in June 2015, Holten has revised the ending so that it follows the so-called Vienna finale. We’ll see the ending the Romantics so much preferred – although Holten’s production leaves us not with the Nietzschean superman, but with a person utterly and terrifyingly alone. The production is a co-production with Houston Grand Opera and is given with generous philanthropic support from The Danish Research Foundation. "No opera (with the odd Wagnerian exception) has ever been safe from cuts"
Sadly this is not so. Many passages have been cut from Wagner's operas. Most often Wotan's narration to Brunhilde in act 2 of the Walkure. I dont object to cuts in principle but I thought the ending of Don Giovanni was weak in the current production.
" I thought the ending of Don Giovanni was weak in the current production." I agree-- with the video projections used in this brilliant set I had hoped for at least some smoke and flames. But never mind - the superb acting of the title star left nothing to be desired. Why is it that, when discussing "Don Giovanni," opera critics so rarely acknowledge the source material, Moliere's "Don Juan," (based on Tirso de Molina's "The Trickster of Seville")? Moliere's tragicomedy, which is as very popular in the 18th Century, ends with Don Juan being dragged to hell and Sangrenelle, (the Leperello character, a comic figure that Moliere wrote for himself) running off stage screaming "my wages! My wages!" That Mozart both used the original popular ending and also tacked a moralizing ending onto a play that was about the high/low duality (Don Juan's tragedy was that he lost his soul: Sangranelle's that he lost his income) is the story here. Having Leperello say "I'll find a better master" is the real radical departure. I suspect that happy endings were tacked onto operas, especially Don and Cosi, to get past censors. It wasn't enough to have the libertine dragged off by demons, the characters have to moralize about it, but note: Anna (did she tell the truth in Act I) still puts of Ottavio; do we believe hot blooded Elvira will go to a convent; Leperello will work for whoever pays the most; the newlyweds will go home to dinner, then what -- recriminations? The original Cosi couples? Anyone believe they not only get back together but stay together in their less innocent states? The Count and Countess? See, further, La Mere Coupable by Beaumarchais. Wouldn't go over in Hapsburg Vienna.